Paul Adams (1954-2000), an early AIDS campaigner who helped form Chicago for AIDS Rights (CFAR) and turned his status as a Mr. Windy City contest winner into an effective activism vehicle. Other involvements included Open Hand Chicago, the Pink Angels anti-crime group, Chicago Anti-Bashing Network, and a press column. Named Mr. Windy City in 1987, Paul Adams was more than just a pretty face: Unlike many of the young men who won the contest, he turned what was essentially a beauty pageant into a platform for politics. Adams and several others formed CFAR (Chicago for AIDS Rights), which evolved into ACT UP/Chicago following 1987’s Second National March on Washington for Lesbian and Gay Rights. From his first arrest for civil disobedience during that historic march, Adams become one of the new Chicago organization’s key members. He took an active role, participating in (and often organizing) dozens of demonstrations, protests, and zaps. 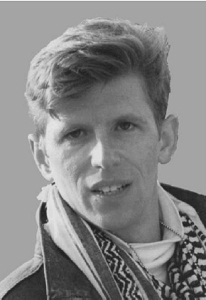 Adams was the man who orchestrated the dramatic takeover of the County Building balcony during ACT UP’s national healthcare demonstration in 1990. Adams was also involved with the NAMES Project and with Open Hand Chicago, volunteering as well as designing the logo for that PWA mealsonwheels organization. He also designed the original logo for The Oprah Winfrey Show that depicted the TV host pulling a wagon. Adams participated in the gay anticrime group called the Pink Angels, and in 1998 he cofounded the Chicago AntiBashing Network in response to a rise in local hate crimes against LGBT individuals. Adams also took part in P.A.W.S. (Pets Are Wonderful Support) and volunteered for Howard Brown Health Center and for Chicago House. In addition, Adams was a talented writer, with regular columns in Gay Chicago as well as Nightlines and Outlines. Another passion was his work at the Field Museum, where he did extensive research on Native Americans’ twospirit people and met with tribe leaders to explore that mixedgender culture. In 1996 he even took several months off to drive to various reservations to deepen his understanding. After a long, valiant struggle, Adams succumbed to the effects of HIV/AIDS and died on November 10, 2000.